Starting out on the right hoof. 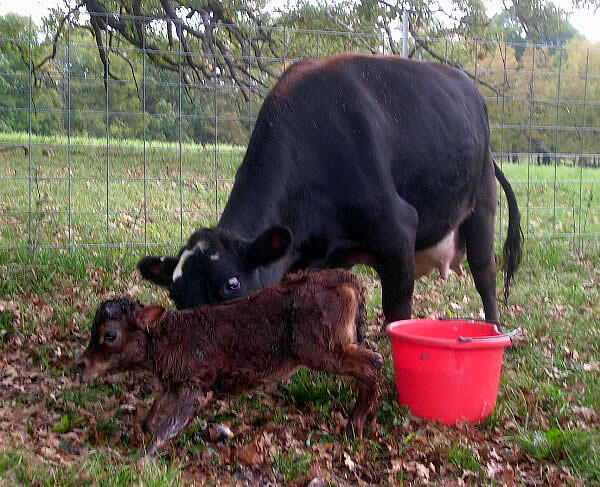 Another new heifer was born to Mini Miracles Farm on Saturday morning, November 9th. What a blessing these lovely creatures are. We’ve named her Dawn Dancer because she fairly danced when she got on her feet just moments after being born. As you can see from the picture, she’s still wet as she steadies herself on brand new hooves. A few days before a cow gets ready to calve (also referred to in the dairy world as getting “freshening”), we get ready as well. First we move the cow to a small paddock close to the house that includes a nice sized box stall. Then we check on her every few hours day and night to see how she’s doing. If it’s really wet or cold we lock the cow in the stall until the calf is born. We make up our “calving bucket” which includes a bucket for water for the cow to drink, several towels, one small towel or wash cloth to wipe the calves nostrils and mouth, iodine with a small cup to soak the umbilical cord in, a milking pail, teat wipes and a 2-quart feeding bottle. As you get to know your cow you will see a distinct pattern in her preparations to calve. Cinnamon, Dancer’s dam, begins to charge around the birthing pen, checking fences, making sure no other cows are around, etc. In the case of this past Saturday, I had left Dinah and her dam in the pasture too and had to remove them because Cinnamon decided it would be easier to adopt Dinah than have her own. Anyway, each is unique, but after a time or two you’ll know when she’s imminent. With anything but a first freshener, when we see her go into labor, we know we’ve got just a few minutes before baby will be born. When the baby is born, I like to be right there so that I can quickly wipe the nose of the calf so that it doesn’t ingest any of the sack or birthing fluids and make certain it takes that first breath immediately. Usually we place a small towel under the head of the baby so it doesn’t get filthy – particularly if born in the pasture as Dancer was. If it’s cool (less than 70 degrees) we’ll help the cow dry the baby off. Did you know that a Jersey calf has very little body fat at birth and anything under 60 degrees can be dangerous for them if not dried off quickly. After the calf stands we’ll put a small cup of iodine under the calf and completely soak the umbilical cord right up to the belly. Within 30 minutes after birth, I’ll have milked the cow and will feed at least 1 quart of colostrum to the baby with a bottle. Usually the calf is looking for milk anyway and by milking and feeding the baby you know just how much she’s gotten of that critical first food. Oh yes, and while I’m messing with the calf, the cow drinks the water I brought her (tepid not cold) – this helps her body flush the placenta later on. Of course, all this really isn’t necessary as cows have been having babies for thousands of years; but these little things can make a tremendous difference in the health of your calf as well as in getting it socialized to people right away.